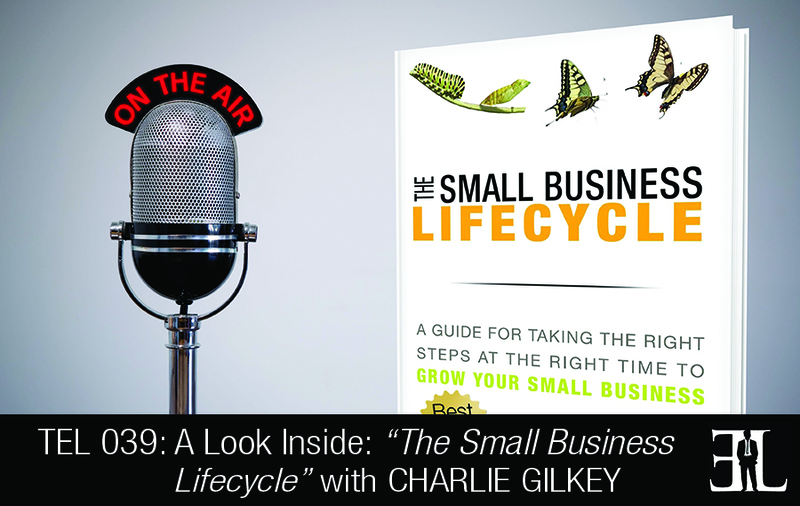 In this episode Charlie Gilkey takes a dive into his book, The Small Business Lifecycle. Unlike other business books that focus solely on marketing and sales, The Small Business Lifecycle discusses how to grow your business through different lifecycles. This book is unique in that it offers entrepreneurs and small business owner real challenges, opportunities, and inconvenient truths about running a small business. This book is what to expect when you’re expecting for small businesses and entrepreneurs. We see a lot of books on small business, and a lot of small business books are focused on sales and marketing. Sales and marketing are huge but there is more to business than marketing and sales. My book really discusses how small businesses grow and that’s one of the things that make it unique. Another key element is it’s not about so much the tactics but about where you are and what you need to do to grow to the next step. It’s intentionally concise and short book because it provides a map for growth for your business and that’s really what all it’s meant to do. It’s both. You don’t have to read it straight from front to back. The overview gives an idea what the stages of the different life cycles are and you can decide where you are and read from there. Figure out where you are in the business life cycle and focus on those things that matter now. You have to do the right things, at the right time, in the right order. Small Business Life Cycle is what to expect when you’re expecting for small business owners and entrepreneurs. There are five different stages to the business life cycle. Stage Zero is The Aspirational Stage, the stage by which everyone that thinks, reads and dreams about starting a business but hasn’t fundamentally started a business. Stage One is The Entry Stage. This person has moved to starting a business, has a few customers, small number of services and products and they are officially in business. Stage Two is The Growth Stage and this is where the business has more customers, more products and services but basically they are starting to take off. They have figured out the market to product fit that allows them to actually start growing and scaling. This stage is the most fun part of the journey for small business owners and entrepreneurs. Stage Three is called The Crucible Stage. In the crucible stage you’re at the position in which you can’t keep going the way you’ve been going and you’ve got to do something completely different to take that next step. Most people find in this stage that there is not nearly as much business under the business as they had thought. Stage Four is The Cruise Stage. I like to describe it like you’re a supersonic jet. You have your people, processes and positioning in place and you can go really fast but you can’t turn. This is where we see businesses that pull in that good 3% to 10% growth every year, not making any radical changes but it’s a solid business and runs well. This is a life-cycle because what happens is people will get at one point along the journey and go backwards. They’ll get to this stage and get bored. I take each one of these stages and explain them. Each stage has a certain amount of challenges, opportunities, inconvenient truth and a way forward. I founded and run a website called Productive Flourishing which is about helping creative people take their ideas and make something good happen in the world. It’s not so much for the dreamer; it’s for the inspired doer. Before starting Productive Flourishing I was simultaneously completing my PhD in Philosophy which I am still working on and I was an Army Joint Force Military Logistics coordinator. I’m a business coach and worked with a range of people who would come to me trying to do things that they were either told to do or read about that were inappropriate for their business. I found that it was just too early for that particular business lifecycle for them to be focused on that particular thing. This book came from speeches where I would try to help entrepreneurs and small business owners really figure out where they were so they could take the appropriate next steps. And it eventually folded into a book where I added more to it. So the inspiration was largely based on observation and the amount of pain that people were in just because they were doing the wrong things at the wrong time.